The highlight of the sale was a drum kit played by Starr on many Beatles hits, which fetched $2.1m (£1.4m). Starr's copy of The White Album, numbered 0000001, sold for $790,000 (£525,000) - which is thought to make it the most expensive record ever sold. Auction house Julien's Auctions said it surpassed the previous world record, set when Elvis Presley's first acetate recording sold for $300,000 earlier this year. Starr's LP was the first mono copy of The White Album to be manufactured in the UK. Sir Paul McCartney told his official biographer: "John got 0000001 because he shouted loudest. He said, 'Bagsy number one!'" But Starr somehow got his hands on it. The 1968 LP was not quite in mint condition, with Starr telling Rolling Stone: "We used to play the vinyl in those days. "We didn't think, 'We'll keep it for 50 years and it will be in pristine condition.' Whoever gets it, it will have my fingerprints on it." However the album has spent the last 35 years in a bank vault in London. 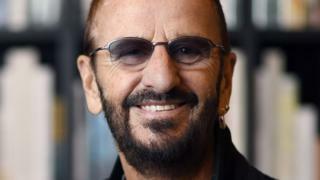 A portion of the proceeds from the auction will go to Starr and wife Barbara Bach's charity The Lotus Foundation, which says it aims to advance "social welfare" in a wide range of areas including substance abuse, cancer, cerebral palsy, domestic abuse and animal protection. "Some of the stuff, it's a real surprise that we still had it because it's been in storage for so long," he said, according to Rolling Stone. "I don't mind getting rid of a lot of stuff and it goes to good use. That's the deal."